The Ford Edge and Jeep Grand Cherokee are both 5 passenger midsize SUVs with starting prices of about $30,000. Both have distinctive styling with the Edge going more for sport and the Grand Cherokee being the more rugged vehicle with Jeep’s trail rated capability. While these vehicles have similar price, power, and interior space, there are important differences that prospective buyers should consider. Performing a Ford Edge vs. Jeep Grand Cherokee comparison can help prospective buyers determine which vehicle better fits their needs. The Edge was redesigned for 2010 with more power, better fuel efficiency, new exterior styling, a new interior, improved suspension, and the debut of MyFord Touch system with an eight inch LCD touch screen. 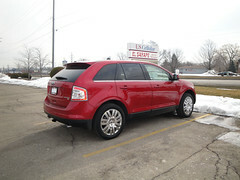 The 2011 Edge is largely unchanged. The Edge is offered in four trim lines – the SE, SEL, Limited, and Sport. The base Edge is offered with a 3.5-liter 285 horsepower V-6 engine. The Sport trim line is offered with a 3.7 liter, 305 horsepower V-6 engine. All Edges comes standard with a six-speed automatic transmission. The SE with front-wheel drive is rated at an impressive, for the class, 19-mpg city and 27-mpg highway. 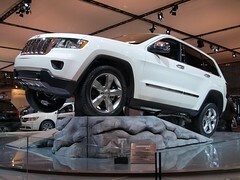 The 2011 Jeep Grand Cherokee is all-new. It comes in Laredo, Limited, and Overland trims with all available in both two-wheel and all-wheel-drive. The Grand Cherokee, like the Edge, offers two engine choices. The standard engine is a 3.6-liter V-6 engine that produces 290 horsepower. However, the Grand Cherokee’s optional engine is the 5.7 liter, 360 horsepower V-8 Hemi. In comparing comparable trims, the 2011 Edge SE with AWD has an MSRP of $32,275 while the 2011 Grand Cherokee Laredo with AWD has an MSRP of $32,215. These models are near exact matches with respect to standard features. Both have power seats standard and come with a standard automatic transmission, although the Jeep has just a five-speed. If you need towing capability, the Grand Cherokee has a clear advantage. Even with the V-6, the model is rated to tow 7,400 pounds. This compares to the Edge, which is only rated tow 3,500 pounds. The Jeep also has superior off-road ability. However, if you want better fuel economy, the Edge is definitely your choice. The Edge is rated at 18-mpg city and 25-mpg highway in this trim while the Grand Cherokee only musters 16-mpg city and 22-mpg highway. Both models fall below average with respect to cargo capacity. The Edge, with its curvy shape, has just 68.3 cubic feet with the rear seats folded, while the Grand Cherokee is a bit larger with 72.3 cubic feet. This is actually less cargo room than some compact SUV models such as the Honda CR-V and Toyota RAV4. In comparison, the seven-seat 2011 Ford Explorer has a cargo volume of 80.7 cubic feet while the Mazda CX-9 has 100.7 cubic feet. Both the Edge and Grand Cherokee come with a host of standard safety features including traction control, electronic stability control, ABS brakes, and driver, side, and passenger airbags. Both models are also safest 2011 SUV picks, according to the list from the Insurance Institute for Highway Safety, although only Ford Edge’s produced after February 2011 made the cut. A Ford Edge vs. Jeep Grand Cherokee comparison shows the pluses and minus of these vehicles. If you want towing power and off-road capability, go with the Grand Cherokee. If you want better fuel economy, go with the Edge. Ultimately prospective buyers need to go with the model that best fits their needs.